Fairfax County comprises 391 square miles bordered by Prince William County to the southwest, Loudoun County to the northwest, Montgomery County, Maryland, to the north, and the District of Columbia and Prince George’s County, Maryland, to the east. In combination with the independent cities of Fairfax and Falls Church, the three jurisdictions make up the Fairfax County Health District. Fairfax County is the most populous county in Virginia, with an estimated population of 1,142,234. 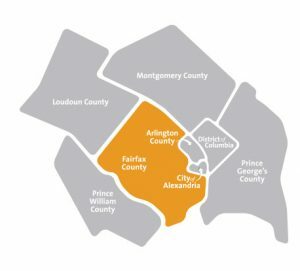 Fairfax City, an independently incorporated enclave of Fairfax County, has an estimated population of 24,013 residents within its 6 square mile jurisdiction. Falls Church is the smallest independent city in Virginia, with an area of 2 square miles; however, it has experienced the greatest relative population growth in the health district, seeing a 13% increase to 13,892 residents from 2010 to 2015. According to the U.S. Census Bureau, in 2015, most of its residents identify as white, followed closely by Asian and Hispanic. Compared to the state of Virginia, Fairfax County’s population is more diverse. Fairfax County’s white population is 11 percentage points smaller than the state; however, Falls Church City’s white population is 9% larger. Fairfax Health District’s percentage black population is one-quarter that of Virginia’s, and its percentage Asian population is more than double the size of Virginia’s. In 2014, both Fairfax County and Falls Church City ranked in the top three wealthiest counties in the nation, along with neighboring Loudoun County. Falls Church has the highest median household income, at $122,092, followed by $112,844 in Fairfax County and $99,671 in Fairfax City; compared to the state median income of $64,792. Altogether, 6.7% of this district’s residents are living in poverty (with Falls Church having the lowest poverty rate at 3.2%), lower than the statewide 11.2% poverty rate. In both Fairfax City and County, approximately 28% of school age children are eligible for free and reduced-price meals, while only 6% are eligible in Falls Church—compared to 42% of children statewide. Although health indicators assist in understanding the health of a geographically defined population, they do not tell the whole story. For example, a baby born in census tract 4221 in eastern Lorton can be expected to live 10 fewer years than a baby born on the other side of Interstate 95, in western Lorton (census tract 4222). In crossing the interstate, median household income drops from $133,413 in western Lorton to $77,901 in eastern Lorton; the percentage of adults with at least a bachelor’s degree drops from 64.1% to 47.2%; and the percentage of black and Hispanic residents more than triples, from 11.5% and 5.2% in western Lorton, to 36.6% and 17.5% in eastern Lorton, respectively. Other measures of health tell similar stories of inequity when broken down by race: black residents have an infant mortality rate nearly twice that of white residents. Amongst Medicare beneficiaries 65+, black residents have an increased rate of hospitalization due to high blood pressure compared to their white or Hispanic neighbors. Hispanics in the health district have the lowest rates of hospitalization due to heart disease, but also have elevated rates of hospitalization due to high blood pressure. Within the Fairfax Health District, there are significant disparities in health amongst people of different races, ethnicities, and incomes. These differences can be partially attributed to social determinants of health, which, according to the World Health Organization, are the conditions in which people are born, grow, work, live, and age. Northern Virginia has a robust healthcare system. There is one primary care physician for every 970 residents of Fairfax County, and one primary care physician for every 310 residents of Falls Church. However, these resources are not equitably distributed. According to HRSA, a southeastern portion of the county, the western Route 1 corridor between Groveton and Lorton, is a designated medically underserved area, meaning it contains fewer than one primary care physician for every 3,500 residents. Inova, the largest hospital system in Northern Virginia, has several locations in Fairfax and Falls Church. Additionally, the Reston Hospital Center, a part of the HCA Virginia health care system, serves the county at one location. The Inova Health system serves the area at multiple sites, including a women’s clinic, two children’s clinics, and three HIV/AIDs clinics. In addition to location, cost may be a barrier for the 12% of residents of the health district under the age of 65 who are uninsured. Fairfax City has the highest uninsured rate in the health district, at 14%. Fairfax County and Falls Church City have uninsured rates of 12% and 7%, respectively. Although these rates are equal to or lower than Virginia’s average uninsured rate of 14%, they remain higher than the averages of neighboring West Virginia (8%), and Maryland (7%), where Medicaid was expanded. Those without insurance or resources to pay for care rely on safety net clinics for primary health care services. Two Federally Qualified Health Centers (FQHCs) serve the health district: HealthWorks for Northern Virginia and Neighborhood Health. The Fairfax County Community Health Care Network (CHCN) is a county-funded primary health care partnership that includes 3 clinic facilities serving uninsured County residents. Other low-cost health resources include NOVA ScriptsCentral, a pharmacy; Northern Virginia Family Service; Northern Virginia Volunteer Dental Clinic; and Springfield/Franconia Family Resource Center. Three free, charitable clinics are located in Fairfax: Culmore Clinic, ADAMS Compassionate Health Care Network, and the Mission Life Center Hope Clinic. The Fairfax County Health Department has 5 district offices located throughout the county, offering immunizations, maternity services, dental services for children, refugee health screenings, and pregnancy, HIV, STD, and TB testing, to some county residents. Although Fairfax County Health District is one of Virginia’s healthiest, inequities amongst its residents exist. Making the district a healthier place for all to live requires not only improving upon wellness initiatives and access to quality healthcare, but addressing needs pertaining to the economic and social well-being of its residents.